What we shall eat tomorrow, I haven't the slightest idea!" said Widow Wang to her eldest son, as he started out one morning in search of work. The winter had been a hard one - extreme cold, deep snow, and violent winds. The Wang house had suffered greatly. The roof had fallen in, weighed down by heavy snow. 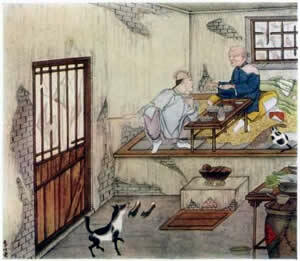 Then a hurricane had blown a wall over, and Ming-li, the son, up all night and exposed to a bitter cold wind, had caught pneumonia. Long days of illness followed, with the spending of extra money for medicine. All their scant savings had soon melted away, and at the shop where Ming-li had been employed his place was filled by another. When at last he arose from his sick bed he was too weak for hard labor and there seemed to be no work in the neighboring villages for him to do. Night after night he came home, trying not to be discouraged, but in his heart feeling the deep pangs of sorrow that come to the good son who sees his mother suffering for want of food and clothing. When the old woman referred to the sorrows of her pets, her remarks were answered by a pitiful mewing and barking from the corner where the two unfed creatures were curled up together trying to keep warm. Just then there was a loud knocking at the gate. When the widow Wang called out, "Come in!" she was surprised to see an old bald-headed priest standing in the doorway. "Sorry, but we have nothing," she went on, feeling sure the visitor had come in search of food. "We have fed on scraps these two weeks - on scraps and scrapings - and now we are living on the memories of what we used to have when my son's father was living. Our cat was so fat she couldn't climb to the roof. Now look at her. You can hardly see her, she's so thin. No, I'm sorry we can't help you, friend priest, but you see how it is." "I didn't come for alms," cried the clean-shaven one, looking at her kindly, "but only to see what I could do to help you. The gods have listened long to the prayers of your devoted son. They honor him because he has not waited till you die to do sacrifice for you. They have seen how faithfully he has served you ever since his illness, and now, when he is worn out and unable to work, they are resolved to reward him for his virtue. You likewise have been a good mother and shall receive the gift I am now bringing." "Poor boy, how surprised he will be at our fortune - and it's all on account of his goodness to his old mother." Thinking his mother had gone stark mad for want of food, Ming-li stared solemnly at her. Anything was preferable to this misery. Should he sell his last outer garment for a few pennies and buy millet for her? Blackfoot licked his hand comfortingly, as if to say, "Cheer up, master, fortune has turned in our favor." Whitehead leaped upon a bench, purring like a sawmill. "Eat and ask no questions," counseled the Widow Wang. "When you are satisfied I will tell you everything." But alas! according to a Chinese proverb, pride invites sorrow. The little family became so proud of their good fortune that they began to ask friends and relatives to dinner that they might show off their good meals. One day a Mr. and Mrs. Chu came from a distant village. They were much astonished at seeing the high style in which the Wangs lived. They had expected a beggar's meal, but went away with full stomachs. "Doubtless they keep very close watch over it. When would you find them away from home, now that they don't have to work any more? As their house only contains one room, and that no bigger than ours, it would be difficult to borrow this golden trinket. It is harder, for more reasons than one, to steal from a beggar than from a king." So skillfully did this crafty woman carry out her plans that within an hour she was back in her own house, gleefully showing the priest's charm to her husband. Not a soul had seen her enter the Wang house. The dog had made no noise, and the cat had only blinked her surprise at seeing a stranger and had gone to sleep again on the floor. Great was the clamor and weeping when, on returning from the fair in expectation of a hot supper, the widow found her treasure missing. It was long before she could grasp the truth. She went back to the little box in the cupboard ten times before she could believe it was empty, and the room looked as if a cyclone had struck it, so long and carefully did the two unfortunates hunt for the lost beetle. "You remember the day Mr. and Mrs. Chu were here, and how Mrs. Chu returned in the afternoon after master and mistress had gone to the fair? I saw her, out of the tail of my eye, go to that very black box and take out the golden beetle. I thought it curious, but never dreamed she was a thief. Alas! I was wrong! She took the beetle, and if I am not mistaken, she and her husband are now enjoying the feasts that belong to us." "That would do no good," counseled the other, "for they would be sure to come out best in the end. We want the beetle back—that's the main thing. We'll leave revenge to human beings; it is none of our business." "We will go together," continued Whitehead. "I will ride on your back when we are fording the river, and you can protect me from strange animals. When we get to the Chu house, I will climb over the wall and manage the rest of the business myself. Only you must wait outside to help me to get home with the prize." No sooner arranged than done. The companions set out that very night on their adventure. They crossed the river as the cat had suggested, and Blackfoot really enjoyed the swim, for, as he said, it took him back to his puppy hood, while the cat did not get a single drop of water on her face. It was midnight when they reached the Chu house. "Pray, good puss, not so fast with your sharp teeth! Kindly be careful with your claws! Don't you know it is the custom now to put prisoners on their honor? I will promise not to run away." "Pooh! what honor has a rat?" "Most of us haven't much, I grant you, but my family was brought up under the roof of Confucius, and there we picked up so many crumbs of wisdom that we are exceptions to the rule. If you will spare me, I will obey you for life, in fact, will be your humble slave." Then, with a quick jerk, freeing itself, "See, I am loose now, but honor holds me as if I were tied, and so I make no further attempt to get away." "That is a great secret, but as I am in honor bound to tell you, here goes. My mistress has just obtained in some manner or other, a fairy's charm - "
"She stole it from our place," hissed the cat, "I will claw her eyes out if I get the chance. Why, we've been fairly starving for want of that beetle. She stole it from us just after she had been an invited guest! What do you think of that for honor, Sir Rat? Were your mistress's ancestors followers of the sage?" "No, certainly not! But hark you, friend rat - you get that golden trinket back for me, and I will set you free at once of all obligations. Do you know where she hides it?" "Live on the memory of your good deed," purred the cat. "It is splendid, you know, to be an honest beggar. Now scoot! I trust you completely, since your people lived in the home of Confucius. I will wait here for your return. Ah!" laughed Whitehead to herself, "luck seems to be coming our way again!" Five minutes later the rat appeared, bearing the trinket in its mouth. It passed the beetle over to the cat, and then with a whisk was off for ever. Its honor was safe, but it was afraid of Whitehead. It had seen the gleam of desire in her green eyes, and the cat might have broken her word if she had not been so anxious to get back home where her mistress could command the wonderful kettle once more to bring forth food. "There!" said the dog angrily, "what did I tell you? Now all our trouble has been in vain - all on account of your stupidity." For a time there was a bitter dispute, and the companions called each other some very bad names - such as turtle and rabbit. Just as they were starting away from the river, disappointed and discouraged, a friendly frog who had by chance heard their conversation offered to fetch the treasure from the bottom of the stream. No sooner said than done, and after thanking this accommodating animal profusely, they turned homeward once more. Soon a steaming hot meal was ready, and you may well imagine how the old woman and her son, heaping praises upon Whitehead, filled the beast's platter with good things, but never a word did they say of the faithful dog, who remained outside sniffing the fragrant odors and waiting in sad wonder, for all this time the artful cat had said nothing of Blackfoot's part in the rescue of the golden beetle. "Oh, my dear Blackfoot," she began laughingly, "you should have been inside to see what a feast they gave me! Mistress was so delighted at my bringing back her treasure that she could not give me enough to eat, nor say enough kind things about me. Too bad, old fellow, that you are hungry. You'd better run out into the street and hunt up a bone." "So dies the one who forgets a friend and who loses honor," he cried sadly, as he stood over the body of his companion.